THIS NEW ELECTRONIC EDITION offers an interactive tour of the medieval Pilgrims Road from France to Santiago de Compostela in northwestern Spain. It presents a series of medieval texts relating to the pilgrimage to, shrine of, and cult of St. James, including the twelfth-century Codex Calixtinus, now in the library of the cathedral of Santiago, as well as descriptions and excerpts from travelers in the later Middle Ages and Renaissance. Version 3.0 is fully searchable, viewable at any number of magnifications, and can be saved to ones desk or laptop computer. 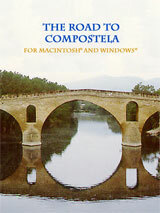 The Road to Compostela also features a Gazetteer of historic places along the Camino, a Dictionary of Saints met along the Road, and a complete and updated Bibliography. It includes a General Map of the Road and 4 interactive detail maps of the route, 12 city maps, 17 plans, 150 color photos and hyperlinks to lodging, dining, and other travel information sites.